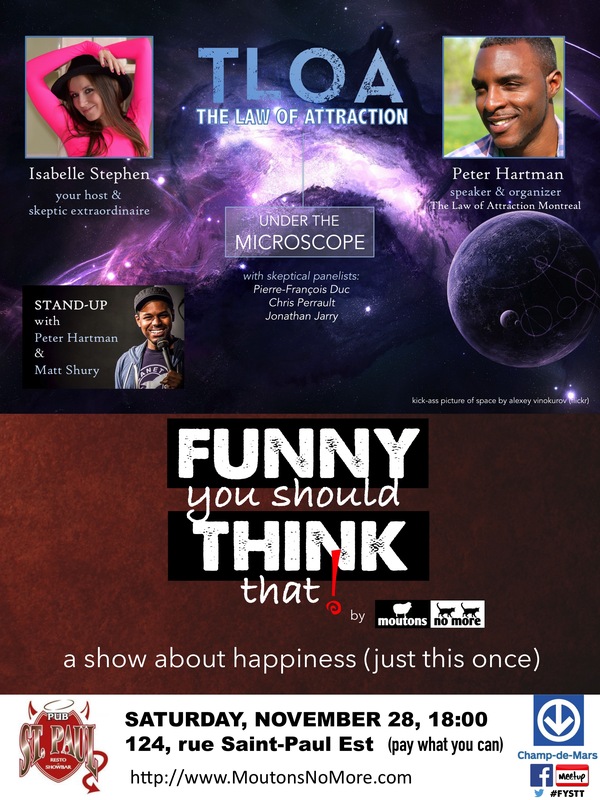 A live monthly event in Montreal: a show of comedy, reason, and alcohol! Our very own Isabelle Stephen snapped some shots last Sunday using the camera she won as the Grand Prize winner of McCord Museum’s latest contest. Guy Renaud hosts Superstitious Password! “Don’t look at the screen!” Anyone having Blair Witch Project flashbacks? You better cover your eyes! This month, Guy Renaud hosts a game show we are calling SUPERSTITIOUS PASSWORD. You will get a chance to come on stage and be teamed up with one of our stand-up comedians, Gina Granter and Karl Knox. Every password is linked to a particular superstition that may surprise you. Prizes to be won! Then, we’ll show you a thought-provoking video on why people believe weird things, and we’ll end the weekend with some stand-up comedy! It’s all happening on Sunday, October 25 at Pub St-Paul in Old Montreal! Psssst! A pitcher of beer will be 15$ for our group! Take advantage.